I ended up with 23 tails on one, and 19 or 20 on the other. Here's what I've written on the concept and directions. This is a very heavy braided flogger with no knots or rivets at the ends. The 23 tails and the width of each tail give for a very satisfying thud, and the braid gives the whip a rough feel, so it feels very different from the silky heavy suede floggers that are not braided. This has become my favorite toy, besides the quirt and hot wax and the cane .... ok, its my favorite flogger. I worked from two sheets of leather suede, one a stone white color and the other a dark forest green. The leather was about 34" x 8" for each piece. 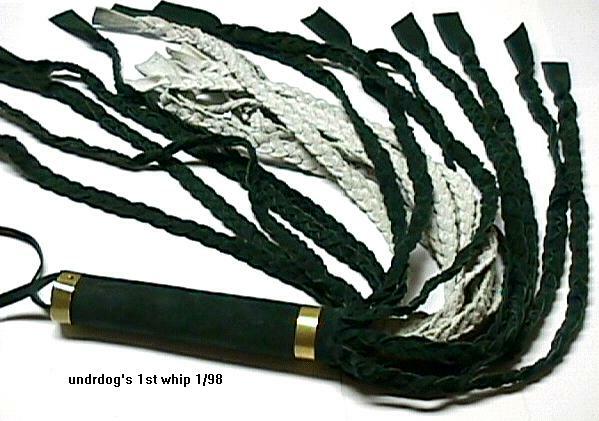 (enough width for 10 - 12 strips at 7/8" each) When the whip is assembled, the white was rolled onto the handle first then the green, so the handle is dark green and the whip appears green until it is flailed, when the white inner tails show. Its about 50/50 white & green. When finished braiding, each tail is 5/8" wide. It is a little wider than the usual 1/2" tail because I was going for a heavy thud feel. For braiding, you'd measure the tails into 7/8" strips, then each strip is sliced into 5/16" strips. Each strip measures 27" long. So, the leather is measured into two segments, 7" for the handle (leave an extra 3/4 " if you have enough leather) and below that, 27" for the tails, running as wide as you need or can accommodate counting 7/8" per tail that you want. I ended up with 23 tails, 13 green and 10 on the white sheet. To slice them for braiding, leave approximately 1.5" at the non-handle end, and slice up from there to the handle, 27". After braiding, the tail will end up about 20" long. When braided, it has the width of only two of the three sections, 5/8" wide. How much strip to leave at the tip of the tail will depend on the thickness of the suede you are using. I left my tips wide and long, because I like how it feels, you could cut the tips to a fancy point, for more sting, or maybe into two points for a serpent's tooth effect.  The braid is the mystery braid, which is closed at each end. So, depending on how tightly you braid it, you may need to slice a little more or less into the tip of the tail. Experiment on your first tail, then cut the rest so that when braided, you have enough slice left in that strip. You can learn how to do the mystery braid from a free flyer at your local leather shop, or most any leather working book. Here's a hint, though: instead of braiding 3x and pulling the end through, braid it 6x and work your fingers down to the end. The tangle will sort itself out. This works till the very end of the tail, when it gets tight and you have to do the braid correctly. I measured and drew all the lines, but only cut and sliced as I was ready to braid each tail. That was easier to deal with than having 13 strips free and flopping around as I was braiding. The handle is 7/8" dowel, 7" long. The leather is rolled along the handle, and rolled on a wooden table so that it becomes tight. The handle feels soft, because it is many layers of rolled leather, but you need to roll it on a table before finally gluing the last edge down, so it is a tight handle. To weight the handle, I used a heavy wood screw or lag bolt, and 5 heavy washers, inserted into the end of the handle where the tails are. Pre-drill the hole. I got the brass strips for around the handles at MJDesigns, a huge craft store. They are fastened with brass finishing nails that you can find in the upholstery section of a hardware store. The holes in the brass and the handle were pre-drilled.